Arsenal picked up three points in relatively simple, not at all complicated fashion last weekend against Burnley, but feel like they are simply treading water in the Premier League. They remain eight points out of first place, but they are alone in second right now, so who knows? As you know, Arsenal have a make-or-break visit to Stamford Bridge next week. Five points out of first and 11 points out of first are two very different things, even in February. 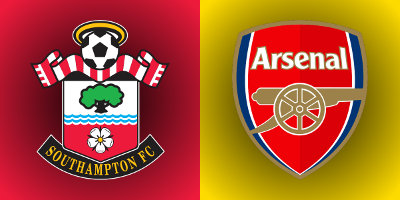 But for now, we focus on the FA Cup, as Arsenal take a trip to St. Mary's to face Southampton. Arsenal have struggled at St. Mary's since the Saints' promotion; in fact, they have not won there since Southampton rejoined the top flight, drawing twice and losing the last two by a combined 6-0 scoreline. It has not been a happy hunting ground (and Arsenal still have yet to travel there in the league this season,) so Arsenal would be advised to exorcise some of those south coast demons tomorrow, before those demons cost them league points later. There is some change in terms of player availability as Theo Walcott is finally back in full training, having figured out how to get that coffee maker to work. Per Mertesacker and Mathieu Debuchy are both back in full training now, but neither are match fit enough to feature yet. Meanwhile, Granit Xhaka will serve the first match of a four match ban after his second sending off of the season last weekend. He'll miss this cup tie as well as league games against Watford, Chelsea, and Hull. Mohamed Elneny cannot deputize there as he is still off with Egypt in the Africa Cup of Nations; the Pharaohs won their group and will face Morocco in the quarterfinals on the 29th. Francis Coquelin, however, has returned, as evidenced by his appearance from the bench and that penalty he gave away against Burnley. Santi Cazorla is the only long-term injury in Arsenal's first team at the moment. Chuba Akpom, who has not made any appearances in cup ties this year due to a back problem, is expected to go out on loan shortly. Elsewhere, there hasn't been any news regarding Yaya Sanogo ever since the cryptic comments Arsène Wenger made about him in December. He did appear, however, in a photograph of a team dinner Alex Oxlade-Chamberlain posted earlier this week. So, that's something. Then again, Mesut Özil wasn't in the picture, so you can get your storm in a teacup from that. David Ospina will likely start between the poles, but other than that, I don't usually predict line-ups for cup ties. New captain Virgil van Dijk has had to see a second specialist over an ankle injury he suffered last weekend against Leicester; he missed the cup tie against Liverpool on Wednesday and is about 25% to feature tomorrow. After selling former captain José Fonte to West Ham earlier in the month, van Dijk's injury leaves Southampton a little light at center back. Maya Yoshida and 22-year-old Jack Stephens started at Anfield on Wednesday. Florin Gardoș is on the way back from long-term injury, but has not played first team football in two years. The Saints might have some worries up top, as well: Jay Rodriguez and James Ward-Prowse both left Wednesday's cup tie through injury, so are listed as doubts. Charlie Austin, purchased from QPR this past summer, is out with a shoulder injury. Jake Hesketh is a 50/50 doubt with an ankle injury. Southampton are also expected to be without Sofiane Boufal, Jérémy Pied, Matt Targett, and Alex McCarthy. 19-year-old Harry Lewis started both FA Cup matches against Norwich City, so it remains to be seen if Claude Puel sticks with the youngster as his cup keeper or if he starts Fraser Forster against a Premier League opponent. On November 30, Southampton beat Arsenal 2-0 in the League Cup to snap Arsenal's 19-match unbeaten run across all competitions. That loss was the first of three for Arsenal over a six-match span, running through consecutive league losses to Everton and Manchester City on December 13 and 18. Since that three week span, however, Arsenal are unbeaten in six again, winning five of them. The one draw in that span was the 3-3 at Bournemouth, in which Arsenal came back from 3-0 down to take a point. The Saints have advanced to the League Cup final, having beaten Liverpool 1-0 in each of the two legs of the semifinals. On the other hand, they needed a replay against Norwich City to advance to this round of this competition. Meanwhile, Southampton had lost four straight in the Premier League before defeating Leicester 3-0 at the weekend. In their 14 matches since beating Arsenal in the League Cup, Southampton have won just six of them, though that includes three straight. Arsenal have already played Southampton twice this season, both times at the Emirates. The Gunners won the league fixture, but lost to the Saints in the fifth round of the League Cup. Arsenal's last win at St. Mary's was on December 29, 2003; Robert Pirès scored the only goal in a 1-0 Gunners' victory. Southampton, of course, were not in the top flight between 2005 and 2012. Arsenal and Southampton have met in three prior FA Cup ties; Arsenal have won all three, in 1927, 1979, and 2003. The 2003 match was the final, with Arsenal winning 1-0 from a Robert Pirès goal in the 38th minute. In 1979, Arsenal went on to the win the trophy after beating Southampton 2-0 in a sixth round replay; they drew the first tie 1-1. Way back in 1927, the sides met in the semifinals; Arsenal won 2-1, then lost to Cardiff City in the final. The referee is Leicestershire-based Kevin Friend. Arsenal have split their two matches with Friend in the middle this season; the loss was the League Cup tie against Southampton at the end of November. The win came much earlier in the season, in August, 3-1 at Watford. Southampton have also split their two matches with Friend; aside from the win over Arsenal, Friend worked the Saints' 3-0 loss at Everton on January 2. All-time, Arsenal have a record of 11 wins, four draws, and two losses with Friend in the middle; the other loss was against Swansea. Southampton have four wins, four draws, and seven losses with Friend across all competitions. Friend was also in the middle for Arsenal's 6-1 win over Southampton back in 2012. Friend has shown only one red card all season and it was to John Terry, so he is truly a champion and a scholar. John Painting is a contributing writer to the Modern Gooner and accidentally just ate a whole bag of granola. You can follow him on Twitter @zorrocat for more idiocy.